Once a stagecoach stop on the Buffalo-Cleveland-Detroit post road, today Dunham Tavern Museum is the oldest building still standing on its original site in the city of Cleveland. The 1824 home of Rufus and Jane Pratt Dunham in MidTown Cleveland is now a designated Cleveland Landmark and is listed on the National Register of Historic Places. In stark contrast to the cityscape that surrounds it, the museum and its gardens offer a glimpse of history and insight into the lifestyles of early Ohio settlers and travelers. Rufus and Jane Pratt Dunham came to the Western Reserve in 1819. The young couple from Massachusetts acquired 13.75 acres of land, which they began to farm. A log cabin served as their home until the north portion of the present structure was built in 1824. Later, the main block of the home was added in front of the original wing and, as late as 1832, the west wing was built. Capitalizing on the home’s position along a well-traveled stagecoach route, Rufus Dunham soon became a tavernkeeper as well as farmer. 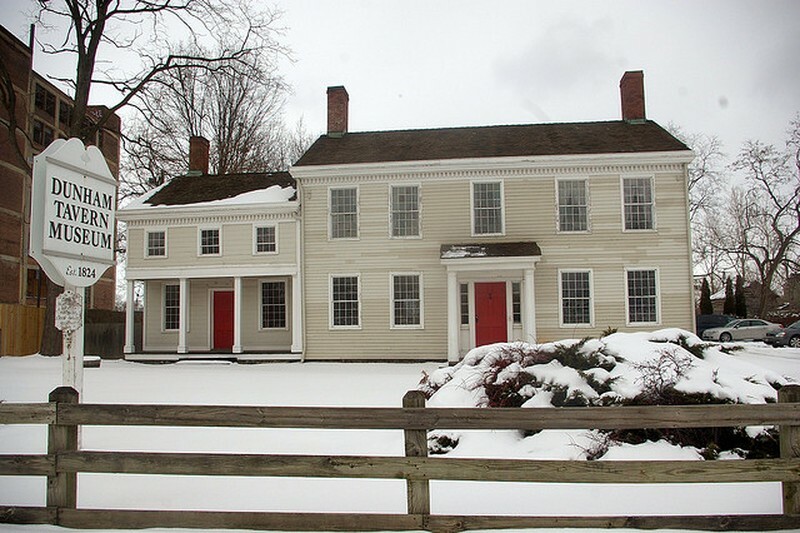 The Dunham Tavern became a social and political center for parties, turkey shoots and meetings of the Whig party. The Dunham’s sold the Tavern in 1853, but it continued to serve as a tavern until 1857 when a banker bought it for his home. Amazingly, this residence stood through Euclid Avenue’s rise and fall. Stagecoach stops to car dealerships, Millionaire’s Row to urban renewal . . . Dunham Tavern has remained. In the 1930s the Tavern served as studio space for a group of WPA artists and printmakers. The Society of Collectors, organized in the early 1930s, became interested in the historic site and eventually took responsibility for the structure, opening it to the public in 1941. Dunham Tavern is now a nonprofit museum supported by donations, members, grants, and monies raised from tours and outreach events.